This dish is not so much a quick fix since cooking potato always takes a little bit longer. How strange :) — when you move to a totally different place, food habits can even change, and I am not only saying ‘adjusted to the locals’. When I came to England, there were many kinds of food I never thought I would like to have one day, now they are all my favorite, from flapjack to wholemeal bread, to different vegetables, like cauliflower, or marrow. Yes, I never liked marrow before, no matter how my parents cooked them. You would think that since I was here alone, I could cook whatever I like and leave out the ‘dislikes’ —who knows, I began to crave for them, and recalled hard — and harder how my parents cooked them, and got fustrated on why the taste did not turn out like the ones at home. If you say it is called ‘emotional chemistry – homesick’, I totally agree. When they were here, my dad was ‘confused’ by the vegetables in the supermarkets, because the varieties and the ‘looks’ were all different to China (although he has briefly lived in other different countries before). It is quite easy home cooking recipe, again, it is hard to find in the restaurants. The main ingredients are marrow and potato. The taste of these two ingredients do not influence each other when cooked together in the wok, but in mouth — not bad combination – both the taste and texture. For marrow, the ones sold in the any markets are good, the only thing is that I prefer to choose the slightly ‘slim’ ones with thin and ‘crunchy’ skin, as they have less ‘seeds’ in the middle, and not too ‘mature’, taste better. However, the problem with marrows is that they are normally relative big, and in this kind of dishes, only half of it is needed, so for avoiding wasting, in the next couple of days, it has to be another ‘marrow’ dish. :) But I try to make it in different recipes. And the potato, again, I used Maris Piper or new potato, coz, potato needs to give that ‘mashy’ feeling. Also I used five spice powder to give some rich taste, as both potato and marrow are quite ‘plain’ in taste as themselves. Garlic, five spice powder , oil, light soy sauce (optional). 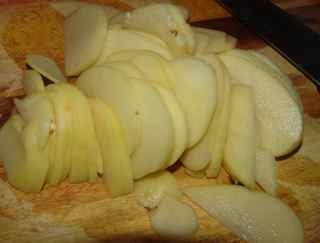 1) Peel and chop the potato into thin slices. 2) Slice the marrow into same thickness as potato. I normally halve it first, then chop from there. If the marrow has many ‘seeds’ in the middle, remove them. 3) Chop around 3 garlic gloves. 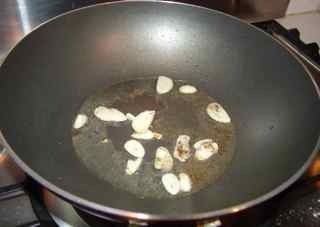 1) In a heated wok, pour in around 4 tablespoons of oil. 2) When oil is hot enough, add chopped garlic in along with 1/2 teaspoon of five (or thirteen) spice powder. 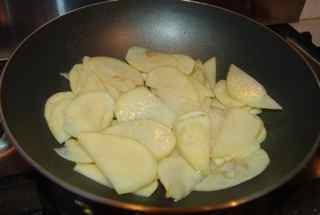 3) When you can smell the garlic and spice powder, add sliced potato into the wok, stir fry. 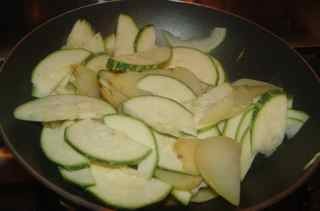 4) When the potato is appearing soft, (I think it is about 3-5 minutes on medium fire), add sliced marrow, and keep on stir-frying. 5) Add in around a bit less than 1 teaspoon of salt and 1 tablespoon of soy sauce. Mix everything well together. 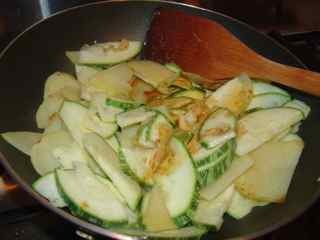 6) If the wok is getting too dry, add in some water or spiced water.